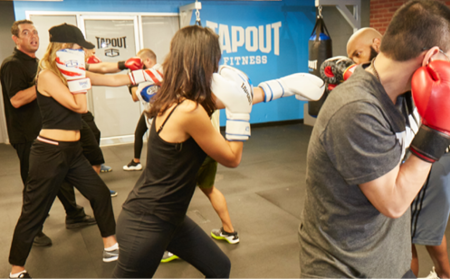 All classes at Tapout Fitness Alameda, CA are led by our highly trained, carefully selected Master Trainers. And their focus is always on you. You will receive personalized attention while feeling part of the group … no matter what size class or what time of day. Boxing technique class is focused on teaching the art of Boxing, called the “Sweet Science,” This hour long class is designed to teach the Foot work and Punching movements used in the sport of modern Boxing. A martial art which creatively involves the techniques of grappling and ground fighting. A modern dance class which is not only includes the excitement of traditionally hip hop movements, but includes a great all-around workout. Pilates is a physical fitness system that was developed in the early 20th century by Joseph Pilates. Pilates classes build strength, flexibility and lean muscle tone with an emphasis on lengthening the body and aligning the spine, rather than on bulking and shortening the muscles. Striking Technique blends the concepts of Muay Thai, Kick Boxing, Boxing and other Martial Arts disciplines into an hour long class designed to teach both basic and advanced concepts in regards to efficient movement and self defense. Born in the Navy SEALs, Suspension Training bodyweight exercise develops strength, balance, flexibility and core stability simultaneously. It requires the use of the TRX Suspension Trainer, a highly portable performance training tool that leverages gravity and the user’s body weight to complete hundreds of exercises. This class is ideal for both beginners and athletes. Developed in Brazil, this submission and grappling martial art form is effective and tough! Our classes are small, so you get lots of one-on-one time with the instructor for rapid skills development and belt-promotion potential. No Gi is grappling without the traditional uniform, instead you wear shorts and a rash guard or Tshirt. It combines moves and theory from several different styles of grappling such as Catch Wrestling, Jiu Jitsu, Sambo and Collegiate Wrestling. Youthful forms of activities to teach kids the different variations of martial arts from non-contact boxing, Brazilian Jiu Jitsu, Capoeira, and much more. In this all-levels class, you’ll focus on developing clear and safe alignment in foundational poses. Come to learn, play, and maybe even break a sweat in a supportive environment. You don’t need to be able to touch your toes; you just have to be willing to try. With accessible alignment principles and biomechanics, you can explore their creative potential, heal, and transform. With a focus on breath and feeling, this class draws from a range of yoga traditions including Anusara, Forrest, and Hatha Vinyasa. In addition to asana, classes include opportunities for pranayama and meditation. Perfect for everybody and every body! Each Zumba® class is designed to bring people together to sweat it on. We take the “work” out of workout by mixing low-intensity and high-intensity moves for an interval-style, calorie-burning dance fitness party. Once the Latin and World rhythms take over, you’ll see why Zumba® fitness classes are often called exercise in disguise. Super effective. Super fun. A total workout, combining all elements of fitness—cardio, muscle conditioning, balance and flexibility, boosted energy, and a serious dose of awesome each time you leave class.